Enjoy healthy travels by packing travel insurance from Pacific Blue Cross. Voted Canada’s most trusted brand of travel insurance 3 years in a row. After all, travel insurance is about your health and we're the health benefits expert. 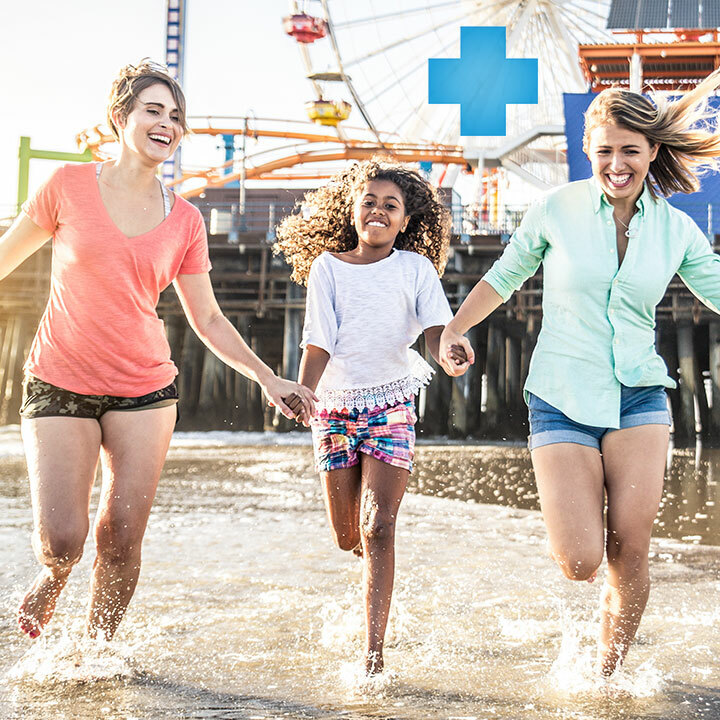 Canadians voted Blue Cross as their most trusted brand of travel insurance again for 2018. Members always save an extra 10% and our family plans cover your children for free. Our emergency assistance team doesn't take a day off. They're available 24/7 should an emergency occur while you are travelling. So from Tacoma to Timbuktu, you're packing the symbol recognized around the work at your time of need. If your employer provides you with benefits from Pacific Blue Cross, our plans protect your lifetime maximum. We are the travel insurance partner of Children's Wish, helping grant heartfelt travel wishes to children with life altering illnesses. Emergency medical coverage for British Columbians who make two or more trips outside of BC each year. Emergency medical coverage for British Columbians taking a one-time trip of up to 6 months outside of BC. Emergency health coverage for tourists, workers, new immigrants and students visiting BC. Peace of mind coverage for travel costs related to unexpected cancellations, interruptions and delays. What if I have coverage under my spouse's plan? Still have more questions? Visit our Travel FAQ to learn more. Looking for other types of coverage? Direct Pay — We will pay any providers directly. Coverage for pre-existing conditions — As long as your pre-existing condition meets a minimum stability period, you can receive full protection. This includes any hospital fees (for a private or semi-private room), nursing fees, drug costs, incidental hospital expenses (television, parking etc), the cost of medical appliances (crutches, canes, wheelchairs), physician and professional fees, diagnostic services (lab tests, xrays), and emergency dental care. In addition to paying for you to return to your province or residence to receive immediate medical attention*, we will arrange to have your vehicle returned, your pet returned and your baggage returned. Should an insured person pass away, we cover the cost of repatriating the deceased. *Requires the authorization of the attending physician and CanAssistance. We cover select treatment costs following repatriation. We will pay for the cost to transport a sick or injured person to the nearest Hospital or accredited medical facility. We will cover the cost of round trip, economy class transportation for a family member or friend to visit a sick or injured person in hospital. We also cover the expenses of this visitor while he/she is staying close by up to $300 per day to a maximum of $1,200. We will reimburse you up to $300/day to a maximum of $3000 for accommodation, meals, essential phone calls and transportation by taxi if your return is delayed due to illness or injury. Hospitalization expenses for ward accommodation. Semiprivate or private accommodation are not covered. The medical and surgical charges for the services of a physician, surgeon or anesthetist, up to the amount payable under the government fee schedule in the area where services are rendered. The purchase or rental cost of crutches, canes or splints, and the rental cost of wheelchairs, orthopedic corsets and other medical appliances when prescribed by the attending physician. The charges for laboratory tests and x-rays when prescribed by the attending physician. The cost of drugs requiring a physician's prescription, except when they are required for the continued stabilization of a chronic medical condition. The fees of dental surgeons for treatment necessitated by an external injury (not as a result of deliberate introduction of food or an object into the mouth), only when natural and healthy teeth, which have had no previous treatment, are damaged, or to reduce a fracture or dislocation of the jaw. We cover the cost of local ambulance or air ambulance service to the nearest accredited medical facility, including inter-Hospital transfer when the attending physician and Medi-Assist determine that existing facilities are inadequate to treat or stabilize the patient's condition. Covers the cost of repatriation to your country of residence by means of appropriate transportation in order to receive immediate medical attention, following the authorization of the attending physician and Medi-Assist. We'll cover the cost of returning a your vehicle, either private or rental, by a commercial agency or by any person authorized by Medi-Assist to your residence or nearest appropriate vehicle rental agency, when you are unable to return the vehicle due to Illness or accident. The plan pays up to $5,000 for the cost of preparation and transportation of the deceased person (excluding the cost of a coffin) to the place of residence, or up to $3,000 for the cost of cremation or burial at the place of death. Covers up to $1,000 ($100 per day for a maximum of 10 days) for the cost of accommodation and meals in a commercial establishment, when a Covered person's return must be delayed due to Illness or bodily injury to himself or to an accompanying Member of the immediate family of the Covered person or Traveling companion.